We had an incredible day completing a range of activities on Monday 6 February. We focused on what learning powers could help us to solve a range of problems. Firstly we learnt about resilience, the importance of challenging ourselves and never giving up even if we found things tricky. 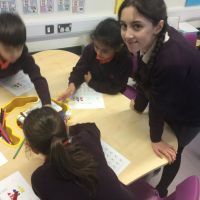 Being an all through school, we immediately through about how this could involve the secondary school students and enable them to develop their leadership skills. 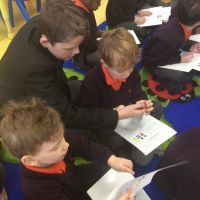 Groups of students came over throughout the day to teach the primary pupils how to solve a problem. They were fantastic teachers and the primary children listened so carefully to them. It was a great opportunity for the secondary students to practise their explanation, questioning and teaching skills. Throughout the whole day, children tackled a range of problems, here is an example of some which they really enjoyed. How can you cross the river with only 5 pieces of paper? Children were given different amounts of paper which they had to use to find a way to cross the river. They had to problem solve different ways to use the paper to make a bridge for their whole team. How can you find your way through the web? 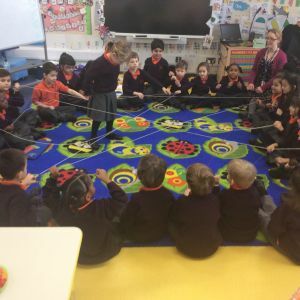 Children created a giant spider web and they had to work as a team to give each other directions to get through the web. 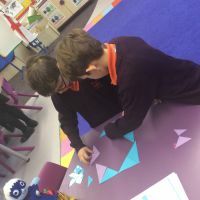 Children solved tangram puzzles by trying to find a way to put the shapes together to make a square! We learnt about a range of superheroes who have special learning powers, which can help us to solve these problems and most importantly to not give up like Resilient Rosie! Listening and Learning hero - We had to listen carefully to what we were asked to do and think carefully about different ways to solve the problems. We also had to listen to everyone’s ideas and make sure we tried out everyone’s suggestions. Collaborating Captain - We had to work as a team to solve these problems as we couldn’t do it on our own. We had to listen to the secondary students and each other because everyone had good ideas. We had to take turns, share and help each other by encouraging them not to give up! Achieving Iron man - Today, we faced challenging work, we had to be proud of our progress and problem solving skills and not just the outcome or when we got the right answer. We had to be proud of the mistakes we made and explain what we could learn from them. We are proud of ourselves when we complete tricky work! It was such a successful day and the collaboration skills showed by all the children was fantastic. From now on we are going to have problem solving Fridays to ensure we don’t forget what we learnt.